With the latest upgrade to our trading interface, we have redesigned the way the tick trades work. Tick trades may now be purchased on Randoms via the Rise/Fall section for a minimum duration of 5 ticks or a maximum duration of 10 ticks. Simply purchase a tick trade as you would any other trade with more flexibility and most importantly, no delays! 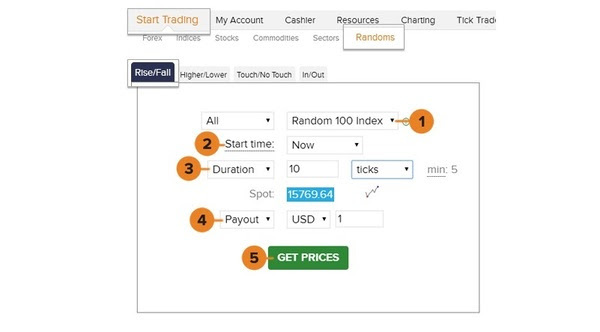 Select your favorite Random Index, choose the start time and duration for your trade by inserting the number of ticks, and finally select your stake or the amount you’d like to receive upon expiry. The trade confirmation window provides you with full pricing information giving you a clear indication as to the potential payout or profit, the total cost of your trade and current market movement, all in real-time. You may also refer to this confirmation window to find out whether you won the trade.